Last year, when the Anaheim Ducks faced a season-defining stretch of games late in the season, they turned to Ray Emery. He did all that he could to help the Ducks make a push for the postseason, but Anaheim didn’t see the need to bring him back after a strong showing. Now, as the Blackhawks face their own crisis between the pipes, Emery has once again stood up and grabbed control of the crease. Since replacing Corey Crawford in Los Angeles on Feb. 25, Emery has been superb. He has allowed only six goals against 132 shots , a .958 save percentage. For his efforts, Emery was named the NHL’s third star for the week ending on March 4. Chicago has followed their nine-game losing streak with a four-game winning streak, a three-game losing streak and have now won three in a row. Without their captain, they have earned two crucial victories over the Red Wings, and had arguably their most complete game of the year in Ottawa. With Jonathan Toews out of the lineup, the Blackhawks have relied on their defensive play to earn wins. After Sunday’s victory in Detroit, the Hawks are 4-3-o since Toews left the lineup. Looking back over Emery’s season, he has actually been more consistent than many fans would give him credit for at first glance. He has allowed more than four goals in a game only three times in 28 appearances. In December, when the Blackhawks were struggling, Emery stepped in and won five straight games to turn the month around. In fact, if you remove two bad games from his season numbers (both from November – five goals allowed in Tampa and seven goals allowed in Edmonton), Emery’s season save percentage jumps to .919, which is a solid number. His save percentage has been at least .900 in every month except November. Perhaps most impressive – and important – has been Emery’s ability to come into a game to relieve Crawford. There were questions about Emery’s ability to come off the bench coming into the season because of his surgically repaired hip, but he has shut up his critics with outstanding play off the bench. In six relief appearances this year, Emery has stopped 72 of 77 shots (.935 save percentage). It now appears that the net is Emery’s to lose down the stretch, and the Hawks are hoping he continues to dominate as the postseason draws near. I like Emerys play alot. But the run he went on in Anaheim last year was way shorter. Do you think he can withstand the physical side of it with the amount of games in front of us? Im not doubting Ray, just wondering what you think Tab. I will openly admit that I was one person (among many) that questioned/doubted Emery during the preseason. He’s proved me to be totally wrong all season, so why doubt him at this point? Kudos to him for a fantastic season, and let’s hope he keeps it up for 3 more months. I really liked the way Duncan K went after Valteri after Flipula slashed Bolland , was it Bolland? Although I resepect what Emery has provided this season, I don’t think he has the physical stamina to take us to the cup… His recent plan would indicate he is up to the challenge, coupled with the improved “D”. Although Detroit only scored 1 goal yesterday, I consider this just good luck. There were several shots that hit iron, and several poor attempts on behalf of Detroit… It reminded me of the blackhawks. I just wonder which team will show up in St. Louis? When I watch the Hawks play when Ray is in net ,I at least get some calmness.It has been some time since Crawford has given me that feeling.I truly believe the uncertainy of whether Crawford is about to let a soft one in plagues the minds of the team.Next time he plays and wins I would think twice and not give him the keys!He seems fragile and should be eased back in.Razors’ comeback is a great story and lets hope it only gets better! Lets not forget the defense had stepped up as well.Seabrook isn’t the only one playing hard.And maybe Im blind but Lepisto is a completely different player.Hes proved me wrong.Another one is Leddy,#8 likes the big games.Ive seen him do some really dumb trash but cant help but notice Super Leddy arrives against Detroit and St Louis just about every time.Last 2 against the Wings especially.I liked Emery in Ottawa and liked his arrival here so far.Hes gone to the Finals.And I wouldn’t doubt he could do it again solely based on hes been close to winning Stanley and his hunger could drive him harder if the rest of the team can get us there.Hope they sign him if they dont aquitr Schneider in the offseason. Brad you are right about one step forward and one back. If our goalies were middle to good we would be at least 5-7 games better on the year. When keepers give up the softies you just watch the team lose some pep and drive. Crawford really helped us in the stretch run last year and was very good against Van. We all know a hot goalie can take you a long way this time of year. Let’s hope Ray can get it done. 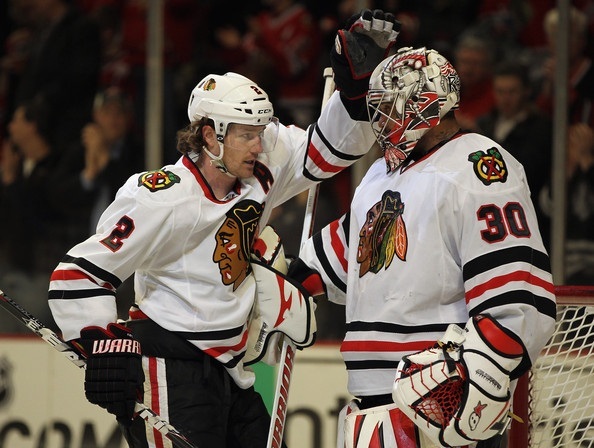 I was for sending Crawford to Rockford back in Feb for a few weeks to try and find his mojo. Give Salak a shot if Ray falters. Fresh face in net gives other teams trouble if they don’t know their weaknesses. Cory just seems lost right now. Tonight should be a good one. Brad, that’s true but the Rangers, Predators or Bruins (and others) would be absolutely nowhere without their goaltending as well. That could happen to any team whether it’s a slump or any injury. It’s not just Emery’s play, the whole team just plays better in front of him rather than Crawford. Almost the same as Huet and Turco previously. 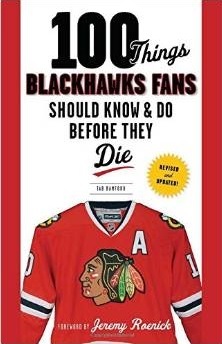 Good to see Bollig got heart—– not sure the rest of the hawks get the message. Emery is the only reason its 3-0. bad ice my *ss, how bout out skating us all over the ice, but more importantly finishing every check possible and making us play scared. We can’t keep up with a team that dominates us the way the blues play.